The Clyde has a very diverse population of fish species, from Atlantic salmon , Brown Trout, Pike, Grayling, Barbel to name only a few. The Clyde for a long time has been famous for its brown trout fishing for both quality and size. Clyde brown trout are well known for their distinctive markings which are a fine scattering of spots pretty unique to Clyde brown trout and truly stunning. Some large specimen trout are produced every year from between 3lbs and 9lbs and stories of larger trout fought and lost. Average trout size is between the 1lb and 2lbs giving considerable sport to the angler trying to fool these wily fish. Only fish above 12 inches can be retained and there is a bag limit of 2 fish per day in place however UCAPA supports and recommends catch and release. The Clyde holds a considerable stock of grayling with a few fish produced every year around the 3lb mark and a good average size around the 1.5lbs. Again only fish above 12 inches can be retained and there is a bag limit of 2 fish per day in place however UCAPA supports and recommends catch and release. Around 20 years ago Barbel (Barbus Barbus) were illegally introduced to the Clyde, these fish are the most northerly population of Barbel in Europe and from what we know they are breeding and holding a steady population. The Clyde Barbel are a very rare and difficult fish to track down and catch due to their nomadic tendencies and small population meaning any angler lucky enough to catch one is truly blessed by lady luck or a very skillful angler. 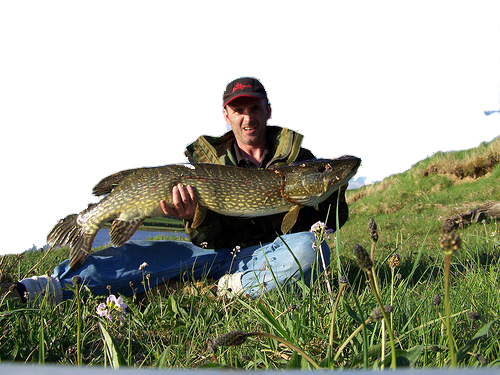 Pike (Esox Lucius) are throughout the river but mainly in slow moving areas of the river. Permit is still required for non migratory species. You will be removed from the river if you do not have a permit.